Alan Plummer Wins Alan H. Plummer Environmental Sustainability Award | Alan Plummer Associates, Inc.
Fort Worth, Texas — The Water Environment Association of Texas (WEAT) introduced a new award: the Alan H. Plummer Environmental Sustainability Award. This award recognizes a WEAT member, an engineering firm, a specific project, a municipality, a water district, a river authority, a private water utility, or a specific municipal or industrial facility that has made significant accomplishments in the field of environmental sustainability practices within the boundaries of the State of Texas. This award was presented at the annual Texas Water Conference. This prestigious award honors Alan H. Plummer, Jr., founder of Alan Plummer Associates, Inc. (APAI). He graduated in 1964 with a B.S. in Civil Engineering from Lamar University and received his M.S. in Environmental Health Engineering from the University of Texas at Austin in 1968. A Board Certified Environmental Engineer, he holds engineering licenses in Texas, Arkansas, Louisiana, Arizona, and Oklahoma. His talents were acknowledged early in his career as he received the Young Engineer of the Year Award from the Texas Society of Professional Engineers in 1974. He has been and continues to be involved with many professional associations, such as WEAT, the Water Environment Federation, the American Water Works Association, the Texas Water Conservation Association, and several national committees. In addition, he is firmly committed to mentoring the next generation of engineers, having served on the advisory boards of Lamar State University, the University of North Texas, and the University of Texas at Arlington. Currently, Mr. Plummer is involved in some of the largest water reuse projects in the world in which highly treated municipal effluent is being used to augment the water supplies of several large water districts in the State of Texas. He is recognized throughout the country as a visionary and expert in the area of water reuse and conservation. He is a frequent presenter at national, state, and local conferences and seminars advocating water reuse as an effective water stewardship and management strategy. 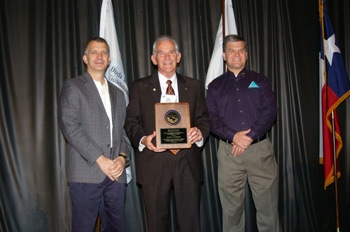 Alan received the award at the Texas Water Conference in Fort Worth, Texas, on April 6, 2011.